In the United States, the word "calico" refers to cotton cloth printed with tiny, tightly spaced, colorful motifs on a colored background. 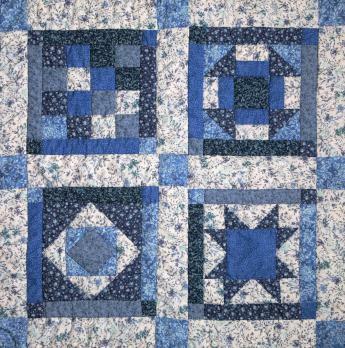 Because many people perceive it as pleasantly old-fashioned, calico has long found favor with quilt makers and it occasionally appears in children's wear. In the early twentieth century, instead of jeans or knits, women typically wore calico dresses and aprons to do housework. Calico of the late 1500s was another matter. The Portuguese, intent upon being the first Europeans to trade for spices directly in the Malay archipelago, had arrived in Calicut, India. There they encountered colored and uncolored cotton cloths of all descriptions, which they designated generally as "calicoes." Perhaps by default, "calico" very gradually acquired a secondary meaning in reference to basic, unelaborated cottons lacking the distinctive characteristics of other ones like "dungaree" or "gingham." Centuries before European traders disembarked in India, a wide range of Indian calicos, including painted or printed ones called chintes, were carried by Arab traders to Turkey, the Levant, and North Africa as well as Southeast Asia. Through their Mediterranean trade connections, wealthy Europeans had enjoyed imported spices and Indian quilted silks. They knew-or desired-little of the cottons, although Armenian entrepreneurs managed a calico trade along with spices and silks. Early in their enterprise, Portuguese, Dutch, and English spice traders learned to appreciate cotton because the spice islanders would not sell their merchandise reasonably for anything other than their preferred Indian cloths-or opium. Thus enmeshed in calico trading, the traders sent quantities of the cheapest-probably left-overs-and some of the most luxurious kinds back home on private speculation or as curiosities. These generated a voracious European market; by the 1660s calico imports had become big business. Fine and heavy linens both could be replaced by the more affordable cottons; the chintes or prints were like nothing else. English traders further expanded their operations by selling calicos to other companies that profitably exported them to Europe and the old-established Mediterranean and Levantine markets. They discovered lucrative markets in West Africa where, in the 1630s, they began selling special checked and striped calico as barter for slaves. The unsold remainders were sold in the West Indies for slave clothing and returned in the form of tobacco and sugar. Natural red dye obtained from the root of a Eurasian plant, Rubia tinctoria. A substance used in dyeing that helps to make the dye color more stable and permanent. Any of a number of dyeing techniques in which part of the yarn or fabric is covered with some material that prevents the penetration of the dyestuff. The processes of indigo resist dyeing and of applying mordants to selected areas of a cloth prior to dyeing in chay (madder) are thought to have originated in ancient times in India. The colored designs were not only brilliant, but fast, or laundry-proof-traits which riveted European imaginations and dollars. Common qualities looked crude because they were produced by the shortcut method of block printing, which also compromised the purity of the colors; printed calicos were inexpensive or downright cheap, and not cherished. The best goods, kalamkari, commanded a much higher price than printed ones, for they were hand painted-a time-consuming, laborious method that moved one exasperated entrepreneur to make remarks about creeping snails. These are the treasures that came to rest in museum collections. European textiles had woven designs, manipulated surfaces, or applied decorations, and, apart from humble stripes and checks, these added significantly to the expense. They were difficult to maintain. Some handkerchiefs were printed with ink-not dye-to make handy city maps or other novelties that were not laundry-proof. Dutch gentlewomen were pleased to wear India chintes but English ladies at first disdained them because the "meaner sort" already had embraced the cheap piece goods that first came along. By the 1660s, however, the upper classes in Europe and America were eagerly augmenting their wardrobes with washable banyans and other informal attire made of calicos custom-painted to their taste. Everyone wanted chintes for the irresistible combination of eye-appeal, comfort, and launderability. When Europeans decided to try their own hands at printing in the 1600s, they printed on Indian calico. To eliminate the problems of dependence upon imported cloth, over the next century England led in developing machinery for cotton spinning and weaving. By 1800, Eli Whitney's American cotton gin enabled a steady supply of American raw cotton to busy mills. All the while, printing processes were becoming highly mechanized. Because European designs were necessarily block printed-painting was too slow and tedious-the mordants required thickening. The trick was to concoct thickeners that gave clean imprints with minimal dulling of the colors. The development of better colors concerned all; mineral dyes and steaming were explored. Dye chemistry became a new field of research. In all aspects of calico manufacture, competition was fierce and industrial espionage rampant; production exploded. The path to commercial success was not straightforward. To protect its own textile manufacturers, France enacted a complex succession of prohibitions against importing, printing, wearing, and using chintes and cottons, effectively destroying its own opportunities from 1686 to 1759. In 1701, established English manufacturers got similar satisfaction, notably in the form of prohibitions against using, wearing, and importing calicos except for reexport. This was augmented twenty years later by prohibitions against using or wearing painted, printed, or dyed cottons made at home, with the exception of printed linens or fustians (linen warp with cotton weft) which were taxed. From 1774 to 1811, cottons woven with three blue selvage threads could be printed for export and a tax drawback obtained. Smuggling and subterfuge ensured that the market remained supplied; legal attempts to foil calico consumption were eventually abandoned. Cotton and prints became accepted as facts of life. America gradually joined England, France, Holland, Germany, and Switzerland in the business of printing cottons. England surpassed its own reputation as the world's source of fine wools to become the world's source of plain and printed cotton cloth, exporting cheap cotton even to India by the 1840s. Calicos are often made at least partly of polyester in the twenty-first century, and it may be safe to say that anyone who wears clothes has worn calico-a phenomenon founded on the ambitions of European spice traders to get to the pepper first. It could be argued that the industrial revolution happened in order to generate and supply a global appetite for calico. Machinery, chemistry, and transportation all tumbled into place seemingly to accomplish this purpose. Brédif, Josette Toiles de Jouy. London: Thames and Hudson, Inc., 1989. Irwin, John, and Katharine B. Brett. Origins of Chintz. London: Her Majesty's Stationer's Office, 1970.